Facebook started out with a wonderful premise, the automation of the college freshman book. Then it got caught in the feature trap that is the bugaboo of way too much software ~ just because I can do something, ought I to do it? Facebook has become unwieldy and bloated as it has sought to commercialize its initial premise – facilitating contacts. 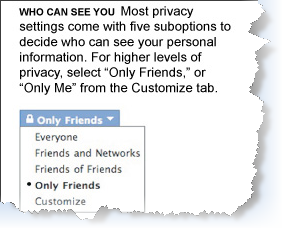 The New York Times published an article on the Facebook privacy settings, including a very unsettling infographic. As the NY Times points out, there are now 170 privacy options, and the policy statement text has ballooned to 5830 words. What Flickr is able to say in less than 400 words requires 14 as many words for Facebook. Further discussion on facebook’s privacy settings (and the fact that not many people seem to understand what they actually are) can be found at the following link. CNN Tech Facebook Delete. At 400 million strong, is Facebook imploding under its own weight? I wish there was a better alternative. This entry was posted in Business Model, Consumer Electronics, social media and tagged facebook, NY Times by geoff. Bookmark the permalink.